Section 4 - Conclusion 14. What future for fluorine and fluorine products? Alain Tressaud is Emeritus Research Director at ICMCB-CNRS, Bordeaux University. He is President of the European Academy of Science in Brussels and member of several European academies. He founded and chaired the French Network on Fluorine Chemistry, sponsored by CNRS, until 2008. He has received several awards, including the CEA Award of French Academy of Sciences (2008), the Fluorine Award of the American Chemical Society (2011), and the International Henri Moissan Prize (2013). His scientific interest covers various fields, including synthesis, physical chemical characterizations, applications in fluorine chemistry, solid state chemistry, and materials sciences. His work also deals with surface modification of materials and intercalation chemistry. Professor Tressaud’s scientific production includes more than 360 papers in international journals, 20 book chapter contributions, and 12 internationalized patents. 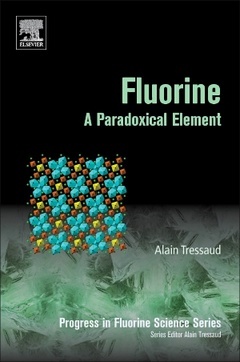 He has also edited several books in his role as editor-in-chief of the series “Advances in Fluorine Science (2006) and “Progress in Fluorine Science (2016) with Elsevier.